IPE Center Locator APP – BIEAP Exam Center Locator To know Address and directions and Ap inter Board Helpline Toll Free Numbers: Board of Intermediate Andhra Pradesh (BIEAP) has launched the IPE Center Locator App for students proceeding to appear for AP Intermediate Examinations for the academic year 2018 -19. The BIEAP has scheduled the AP Inter 1st year examination dates from 27th February to 16th March while the Inter 2nd year examinations will be conducted from 28th February to 18th march . BIEAP has also released the Intermediate hall tickets for aspirants appearing for the examinations. Candidates presently going to appear for IPE Inter 1st year / 2nd year examinations can check more details below. What Is IPE Center Locator App? 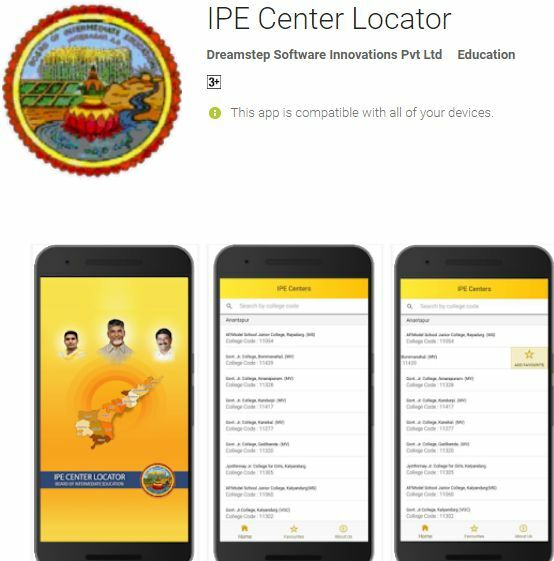 The IPE Center Location App was specially introduced by the AP Government for the convenience of aspirants who are going to appear for AP Intermediate examinations. Candidates can download IPE Center Locator App from the Android and Ios operating systems. This app can be easily downloaded from the Google Play Store for Android mobiles and App store for IOS mobiles. After downloading this app, click on install button. Automatically, it gets installed on your mobile. Open the App and search for the examination center details from it. It will show the exact location, address of the exam center. The Google route map can be clearly visible in the app. With this assistance, students can easily reach the examination centers. So that, they can avoid the late reaching, couldn’t find the exam center, complexities in finding the exam centers and other problems. All the students appearing for AP Intermediate examinations can download IPE Center Locator app and reach the examination center in time. All the students are advised to report to the examination centers before 30 minutes of the exam. Also, do not forget to carry the admit hall ticket while going to the examination center. Step 2: Search for IPE Center Locator App in the search section. Step 3: Soon after the app appears on the screen click on download button. Step 4: The app gets downloaded. Step 5: Click on Install Button; it will automatically have installed it your mobiles. Step 6: Open the App and search for your examination center details, route map, from it. Board of Intermediate AP has scheduled the AP Inter 1st year and 2nd year examinations in February/March months this year. Both the examinations will be held in the morning session from 9 AM to 12 PM. AP Inter 1st Year examinations are going to start first. Junior Inter examinations will be held from 28th February and the Senior Inter examinations will be held from 1st March. Today, AP Education Minister Ganta Srinivasarao has announced the complete details of AP Intermediate examinations. The AP Government is going to conduct the Inter examinations in 1423 examination centers and 48 self-centers. As per reports, 10.26 lakh students are going to appear for AP Intermediate examinations this year. The BIEAP has also provided the helpline number for students to support them during the examination period. Students can ask various queries by dialing to the BIEAP helpline number 0866-2973140. Students can ask examination center details, exam dates, hall ticket related doubts, and other details by dialing to this number. Students can report their complaints about to the Toll-free No. 18002749868 on the colleges that violated the provisions. Students can ask any queries regarding the examinations on phone number – 0866-2974230, Fax Number – 0866-2970056. The BIEAP has introduced the grading process in marking scheme of AP Intermediate. AP Intermediate Board Secretary B. Udayalakshmi has said that the BIEAP is going to introduce the grading process from this year. To avoid the student suicide’s due to pressure, the AP Government has introduced the Grading system from this year.